The South Atlantic League title will be decided at FirstEnergy Park! The BlueClaws are back in the South Atlantic League Championship Series with Games Three, Four and Five at FirstEnergy Park beginning on Thursday night. Note that Games Four and Five are "if necessary." The BlueClaws Post-Season is presented by Toyota World of Lakewood. 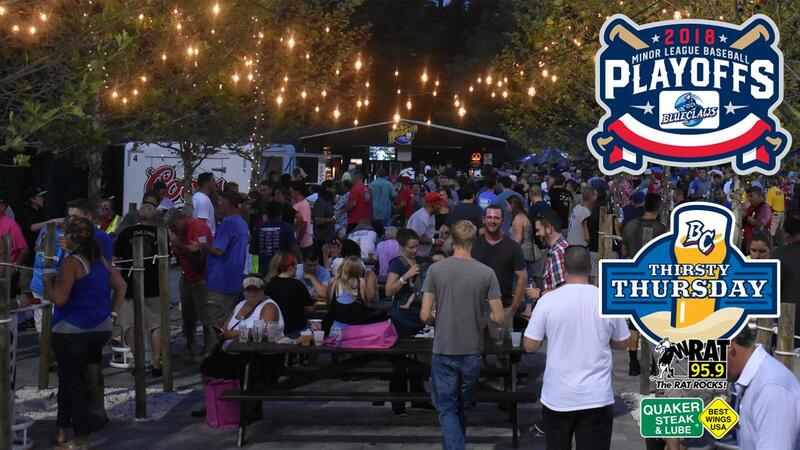 Thursday night is the last Thirsty Thursday (95.9 WRAT) in the BlueClaws Biergarten. We'll have dollar Coors & Coors Light drafts plus 75-cent wings from Quaker Steak & Lube! Gates will open at 6:00 pm and first pitch is at 7:05 pm for all three nights. Tickets - Tickets are currently on sale by calling 732-901-7000 option 2 or online by clicking here. Membership Plans - Playoff tickets are free with the purchase of a 2019 BlueClaws Membership Plan. BlueClaws Membership Plans include tickets to some of the top games of the year plus hot dogs, soda, ice cream, mini golf, and a boardwalk game ticket at all games. Five Game plan holders receive two Premium Items while Ten Game plan holders receive three. Ten Game plan holders also enjoy early entrance, on-field batting practice, and much more. To learn more about BlueClaws Membership plans, click here. The BlueClaws are looking for their first South Atlantic League title since 2010 and their fourth overall after winning in 2006, 2009, and 2010.